As someone who eats a mostly Pescatarian diet, it is very difficult to find decent food when traveling to some of the smaller towns in the Midwest. However, there is one place Mr. Beet and I found, in the town of Peru (about 2 hours north of Indianapolis) that caters to a variety of special diets. And they do it very well. The Voodoo Public House is the place. 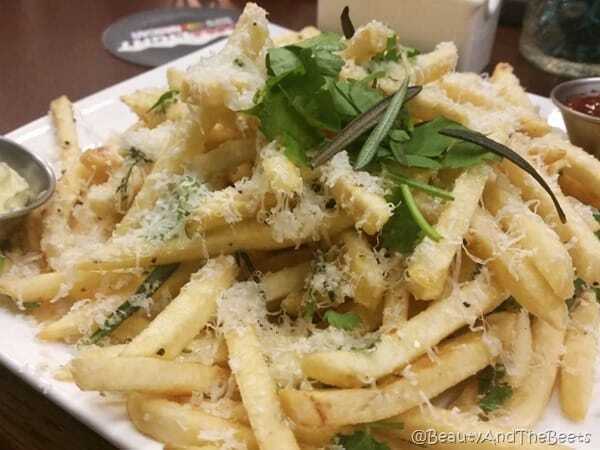 Each time we go, we start with an order of the Parmesan Truffle Pommes Frites. Perfectly crisp, perfectly seasoned – you can’t go wrong with the fries. 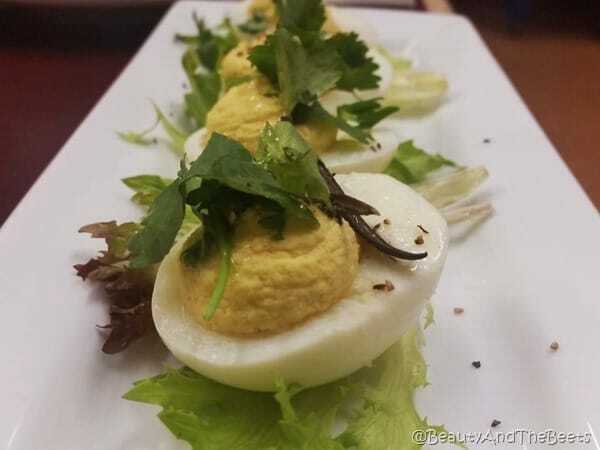 And the Truffle Deviled Eggs are the bomb. Though they are normally also served with bacon, the kitchen is more than happy to remove the meat. 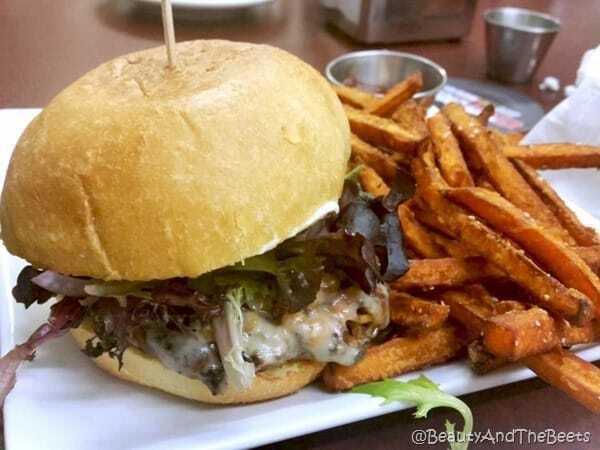 Any restaurant that makes their own veggie burgers in house is our favorite place. And Voodoo Public House has TWO veggie burgers to choose from. One is the V burger, made with 100% GMO-free soy and Vegetable Protein. And it is tasty. 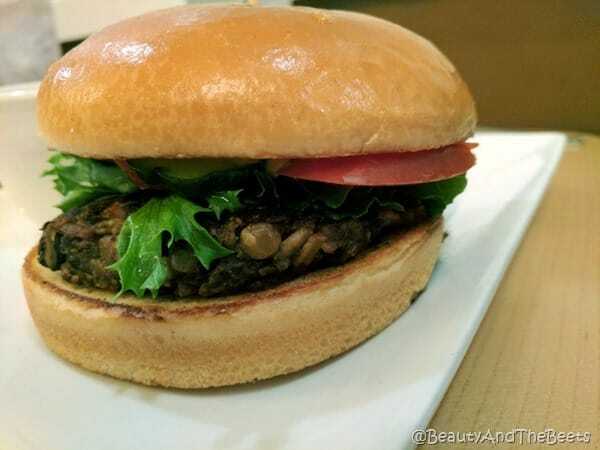 However, Mr. Beet and I both love the Black Bean Burger with black beans, lentils, sunflower seeds, carrots, and oats. And there is a huge variety of burger toppings to choose from including horseradish mayo, sriracha aoli and even peanut butter. 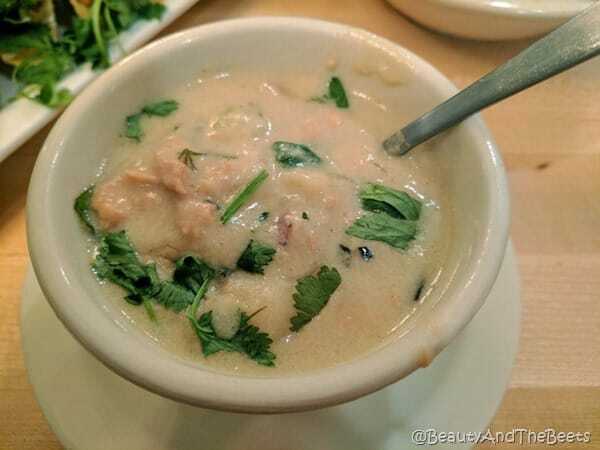 I love the Salmon Chowder when it is available with huge pieces of shredded salmon, potatoes, peppers, garlic, and herbs. 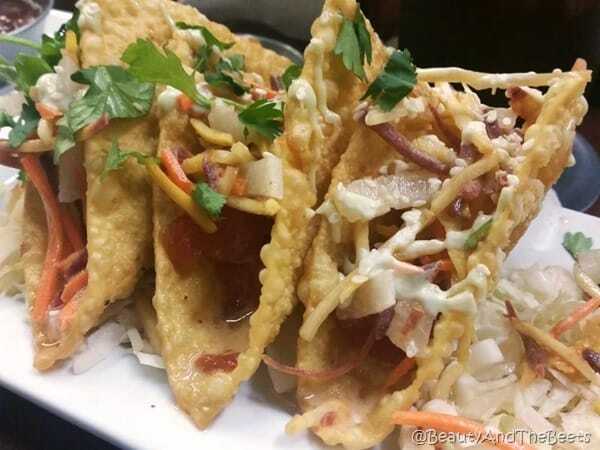 My favorite item on the menu is Ahi Tuna Tacos. One would simply never expect to have good ahi tuna in the middle of Indiana but the Voodoo Public House does a good job here. The dining room is not very big so expect to wait a few minutes for a table on a weekend night But whatever the wait, or the drive is to get here, you will not be disappointed. 4 1/2 out of 5 sprouts.